Our new holiday bungalow cottage with large private saltwater pool is located in lovely Sekawa Beach Estate, a small park-like estate hidden a half mile from the main road and tucked away along a mile long secluded beach on the north shore of picturesque Savusavu Bay on Fiji's second largest and virtually undiscovered island of Vanua Levu. Take a step back in time and discover the tropical beauty and peacefulness of a 'hidden paradise' that most visitors never see! Awaken to a chorus of tropical birds and gentle waves lapping just steps from your bungalow cottage. 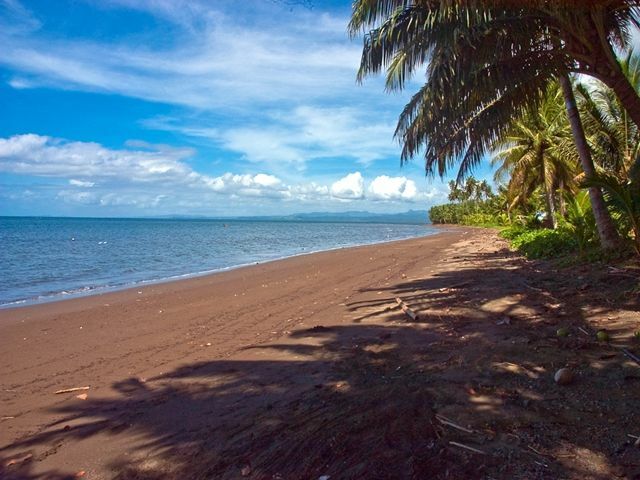 Gaze at the tranquil waters of lovely Savusavu Bay from your bed or take an early morning stroll along the long powdery soft sand beach to hunt for interesting shells. Enjoy a refreshing dip in your large 11' X 21' private saltwater pool or the shallow warm waters out front in Savusavu Bay. Take a peaceful walk through our beautifully landscaped tropical gardens and lily ponds and spy some of Fiji's most colorful birds such as the Collared Lory, Fiji Parrotfinch, and Fiji's rare Orange Dove. Snorkel at colorful coral reefs teeming with tropical fish just offshore in Savusavu Bay or kayak up the nearby Nasekawa River, floating past virgin jungle and small native settlements. The rest of the day can be spent lounging on the large verandah or relaxing in our oversized lover’s hammock under the palms as the gentle breezes lull you into total relaxation. Enjoy a relaxing massage given out in the beachfront bure with only the sounds of waves & birds in the background. Take a nap, read a book or just watch the clouds drift by. Do as much or as little as you like! Our traditional Fijian 'bure' is the perfect place to end each day with 'happy hour' spent watching a spectacular sunset framed by the surrounding jagged volcanic peaks as the lights of Savusavu twinkle from across the bay and the Southern Cross rises in the clear starry sky. Staying with us offers you the rare opportunity to personally meet the friendly Fijian villagers that often come to the beach to fish for their daily catch. It is a truly memorable sight watching a group of ladies fish with their large nets or float by on a bamboo 'bilibili' raft, just as their ancestors have done for hundreds of years. The ladies will be delighted to show you how they weave a basket, hat or fan from a palm frond. Enjoy peace & quiet! Our bungalow cottage is on town power so there is no constant generator hum. However, we do have generator back up if power should go out briefly. If your idea of the perfect getaway is to 'entertain each other' rather than 'be entertained' our relaxing Tropic Splendor beachfront cottage is the ideal place to enjoy your Fiji holiday! We are full licensed by the Fiji Hotel Licensing Board and a member of the Fiji Islands Hotel & Tourism Association and Savusavu Tourism Association. Amenities: Our beautiful beachfront cottage with 600 square feet of interior space and a 600 square foot spacious verandah is fully self-contained. Polished native hardwood floors and natural wood interior are decorated with authentic native Fijian handicrafts made by local craftsmen. ** Featuring a comfortable king-sized bed, quality linens and tiled bathroom with hair dryer, heated towel rack and shower. ** Full sized gourmet kitchen complete with all modern appliances including coffee maker, blender, rice cooker, toaster, microwave and dishwasher. Both Fiji 240 vac/50 hz and US 110 vac/50 hz power outlets in each room. ** The lounge includes comfortable furniture plus color TV, DVD player and radio. ** Extensive reading library, many board games and puzzles. ** A/C as well as screened louvered windows and ceiling fans provide fresh ventilation throughout. ** Complimentary laundry facilities available on site. ** Oversized 'lovers' hammock to relax in. ** Complimentary transfers to & from Savusavu Airport. ** Mile long powdery soft sand beach with warm waters excellent for swimming, beachcombing and running. ** World-class snorkeling, scuba diving and 4-day PADI certification courses are available through several local outfitters. ** Village visits, jungle walks and waterfall hikes with Fijian guides are available for a small fee. ** A traditional Fijian 'meke' song/dance program performed by children from the nearby Fijian village is available for a small donation. We are a young family. I am a Fijian and my husband is from Switzerland. We have two children Ethan and Axel. Before we bought the property we were sailing around Fiji and operating as a charter business. Thanks to the yacht we got to know this beautiful hidden paradise. We will make your stay an enjoyable and a memorable one! Sekawa Beach is a beautiful and quiet beach with only the friendly village ladies fishing off it with their large nets on a daily basis. With its beautiful scenery and secluded beach ideal for swimming and sea kayaking at any tide, Sekawa Beach is the perfect place to enjoy a quiet, peaceful beachfront holiday. Imagine waking up to the chatter of numerous birds first thing in the morning and the gentle waves lapping on the mile long beach perfect for strolling or running. It is truly a delight to meet the friendly Fijian villagers fishing off the beach and be invited back to the village for church or a school visit. Built and furnished to upscale American standards, our beautiful new beachfront cottage features a tiled bathroom & shower. •	Hair dryer, heated towel rack (for drying towels), small fan, large mirror and smaller magnifying mirror. •	Quality towels, Pure Fiji soaps & shampoo/conditioner & toilet paper. •	Romantic bamboo garden shower for two just off the verandah and surrounded by lush tropical greenery. Free to Air Broadcast service only. Guests must provide personal content. Customer must bring any content for personal use. Some books are available, please feel free to leave yours behind for someone else. Some cards and board games are available. None provided by Tropical Splendor. Movie rentals are available in Savusavu town from local retailer. Smoking is allowed out of the cottage. Truly off the beaten path! Sekawa Beach Estate is located on the north shore of spectacular Savusavu Bay, a scenic 12-miles (15 minutes) by car past colorful Fijian villages, from quaint little Savusavu town with its well stocked grocery, many shops, several restaurants, art gallery, handicraft market and a colorful open-air fresh veggie & fish market. The Savusavu Yacht Club and Copra Shed Marina are a favorite for visitors from around the world and the local community. Another place not to miss is the Grace Road restaurant because they serve organic food only. Golf: ** Golf & tennis can be arranged at a nearby resort. ** Tour J Hunter Black Pearl Farm located in Savusavu Bay. ** Rental car available. Ski: ** Complimentary use of our sea kayaks & snorkeling gear for your enjoyment. Beautiful coral reefs await your visit just minutes by easy kayak paddle. ** World-class scuba diving and 4-day PADI certification courses are available through several local outfitters. ** Deep-sea fishing trips available through local outfitters.